Interstate 295 follows the Anacostia Freeway northward from Maryland 210 and the Capital Beltway at Oxon Hill, Maryland to the 11th Street Bridge (Interstate 695) in Southeast Washington, DC. The freeway originates at a systems interchange located at the east end of the Woodrow Wilson Bridge (I-95/495) and north of National Harbor. Northward into the District of Columbia, I-295 runs along the bluff line overlooking the Potomac River next to Joint Base Anacostia-Bolling (JBAB). 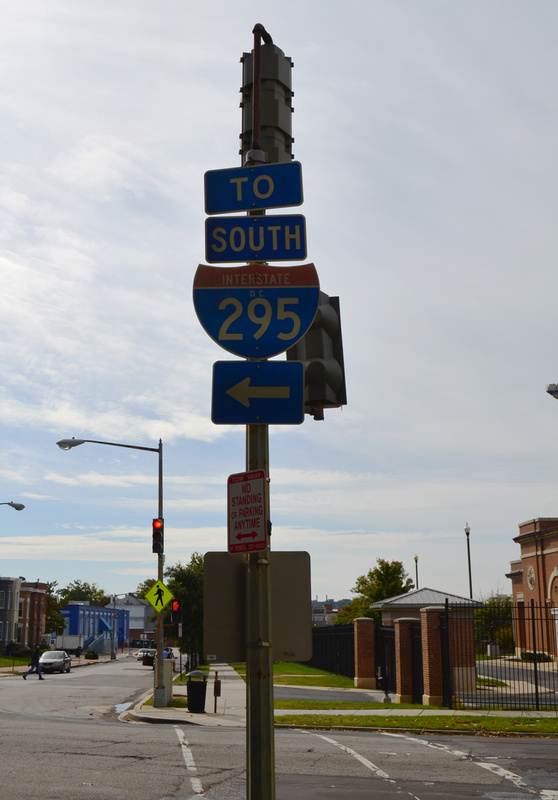 DC Route 295 extends the Anacostia Freeway northeast onto the Kenilworth Avenue Freeway and Cheverly, Maryland. Interstate 295 was approved along with I-695 at Washington, D.C. in 1958. I-295 was assigned from the Capital Beltway in Maryland northward into D.C. along the Anacostia Freeway. The route was assigned to the 11th Street Bridge over the Anacostia River to the East Leg Freeway north to Interstate 95. Interstate 695 was approved as a short, east-west freeway linking I-295 with the Center Leg Freeway (I-95). The 1960s and 70s anti-freeway revolt in the District of Columbia resulted in the cancellation of several Interstate highways in Washington. Included was the East Leg Freeway taking I-295 northward. A separate proposal emerged to alleviate traffic associated with that missing connection in 1982. It outlined extending Interstate 295 east along the unconstructed Barney Circle Freeway, providing a high speed route between the central Washington and D.C. 295 (Kenilworth Avenue Freeway) northbound. The Barney Circle Freeway proposal was met with similar resistance to the East Leg Freeway. It was subsequently removed from consideration in 1996. Plans commenced in 2007 to reconstruct the Southeast Freeway (I-695) and rebuild the 11th Street Bridge (I-295).1 Work replacing the Anacostia River crossing and upgrading the interchange between the bridges and Anacostia Freeway (I-295 south and D.C. 295 north) kicked off in December 2009. I-295 begins at I-95 in Maryland near the Woodrow Wilson Bridge. It runs north into DC where it turns west at an interchange with DC 295 to cross the Anacostia River via the 11th Street Bridges. On the west side of the river, I-295 turns north at an interchange with I-695 and extends to its terminus at Pennsylvania Avenue at the Barney Circle. The planned route for I-295 continues north from Barney Circle to East Capitol Street near RFK Stadium, and then northwest through the city to an interchange with other unbuilt freeways near New York Avenue. The segment of I-295 north of East Capitol Street was withdrawn in 1978. The unbuilt portion between Barney Circle and East Capitol Street was never officially withdrawn. Because I-295 was not completed, the system ramps that provide route continuity from the 11th Street Bridges to Barney Circle are operationally obsolete and have been closed to traffic for several years. The District is requesting de-designation of 2.05 miles of I-295 from the interchange with DC 295 to East Capitol Street. This includes 1.24 miles of existing I-295 and 0.81 miles of unbuilt I-295. After de-designation, I-295 will become a continuous freeway with DC 295, which will serve to rationalize the interstate system in the District. The portion of I-295 between I-695 and Pennsylvania Avenue will be converted to an urban boulevard with connections into the neighborhood street system. The future disposition of additional right-of-way no longer needed for highway purposes will be determined by the District and FHWA. The portion of I-295 between DC 295 and I-695 will be redesignated as I-695 under a separate request. Subjected to Federal Highway Administration (FHWA) concurrence, AASHTO approved this request on May 15, 2009. Signs for I-695 were eventually unveiled in November 2011. The new 11th Street Bridge for I-695 west opened in December 2011. The eastbound span followed in January 2012. Upgrades to the interchange with I-295 and D.C. 295 were completed in phases throughout 2012. Overheads posted at the I-295 southbound ramps for the Capital Beltway. 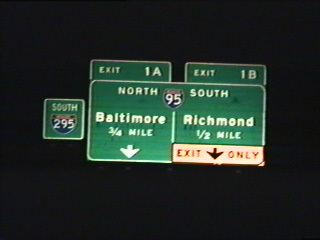 The sign on the left was later replaced with a Maryland 210 sign. Vidcap taken 02/99. The 11th Street Bridge (unsigned I-295 at the time) previously defaulted onto I-295 south to Maryland beyond a left exit to Martin Luther King, Jr. Avenue. Vidcap taken 05/27/95. The south end of Interstate 295 was originally located at a cloverleaf interchange with the Capital Beltway. It included a roadway stub for an unconstructed extension of the freeway southward toward Indian Head. Eventually 1.7 mile long ramps were constructed between I-295 and MD 210 (Indian Head Highway) at Oxon Hill. Opened in 1990, these ramps are not inventoried in the Maryland Department of Transportation (MDOT) Highway Location Reference (HLR) log as either I-295 or MD 210. Indian Head, which is located in Charles County to the south, is connected to the Capital Beltway and I-295 along MD 210. Construction from Fall 2016 to Fall 2020 converts a 1.8 mile section of Indian Head Highway into a limited access highway. The cloverleaf interchange joining I-295 with I-95/495 (Capital Beltway) was upgraded to a multi level systems exchange during the Wilson Bridge Reconstruction Project in the mid-2000s. Maryland DOT/SHA modified signs during that work on Interstate 295 southbound to read “MD 210 South – Indian Head” in place of “I-295 South – Indian Head.” Additional work completed in 2009 added ramps with newly constructed National Harbor Boulevard to the south. Baltimore-Washington Parkway extends north from MD 201 (Kenilworth Avenue Freeway) through Prince George’s County to Fort George G. Meade, Jessup, Thurgood Marshall Baltimore-Washington International Airport (BWI) and Cherry Hill in the city of Baltimore. Maintenance of the limited access highway is split between the National Park Service (NPS) and MDOT. North End – Washington, D.C.
Interstate 295 ends and District of Columbia 295 begins at the left exit for I-695 west across the 11th Street Bridge. Interstate 695 leads toward Downtown Washington while D.C. 295 angles northeast toward Cheverly, Maryland and U.S. 50. Photo taken 12/16/16. 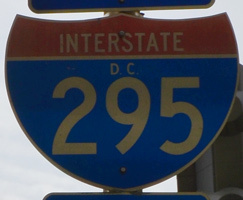 A begin D.C. 295 shield was posted along I-295 (Anacostia Freeway) north ahead of the 11th Street Bridge. 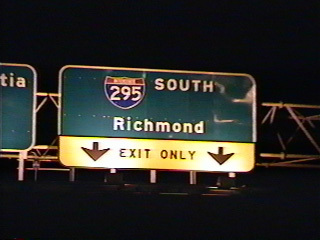 The continuation of I-295 to the Southeast Freeway (I-695) was signed as “To Interstate 395.” Photo taken by Steve Hanudel (08/12/05). The previous separation of Interstate 295 and D.C. 295 north. Exit 4 represented the continuation of I-295 north to the Southeast Freeway (unsigned I-695), while D.C. 295 extended the Anacostia Freeway north to the Kenilworth Avenue Freeway at East Capitol Street. Photo taken by Steve Hanudel (08/12/05). D.C. 295 (Anacostia Freeway) south separates with a two-lane ramp joining Interstate 695 (11th Street Bridge) west to Capitol Hill and a two-lane flyover continuing south to I-295 and Oxon Hill, Maryland. Photo taken 08/04/13. This begin Interstate 295 overhead was attached to the 13th Street SE overpass as the Anacostia Freeway transitioned from D.C. 295 to I-295. Photo taken 12/26/06. A second begin Interstate 295 sign was posted ahead of the on-ramp from the old 11th Street Bridge south. Photo taken by 10/01. Opened in January 2012, the southbound 11th Street Bridge (I-695 east) provides access to both I-295 south and D.C. 295 north, a change from the previous interchange that connected with the Anacostia Freeway south only. Photo taken 12/16/16. Former Northern Terminus – D.C. 295 at Pennsylvania Avenue SE – Washington, D.C. The Southeast Freeway continued beyond the 11th Street Bridge (I-295 south) to Pennsylvania Avenue. The spur east of the 11th Street Bridge was an unsigned portion of I-295 remaining from the 1982 Barney Circle Freeway proposal to extend I-295 east to D.C. 295 east across the Anacostia River. Photo taken 06/02/03. Just north of the Washington Navy Yard, Interstate 695 split into branches for Pennsylvania Avenue east (the north end of unsigned I-295) and I-295 south to Martin Luther King, Jr. Avenue. Photo taken 06/02/03. A full-Y interchange joined the Southeast Freeway with the 11th Street Bridge. The Southeast Freeway spurred east a short distance to Pennsylvania Avenue SE ahead of the Anacostia River and ramps with D.C. 295. Photo taken 06/02/03. An end sign precedes the Maryland state line for Interstate 295 south. This sign dates to the 1990s. Photo taken 12/16/16. Just beyond the state line, Interstate 295 separates into four ramps. Exit 1C departs first for the Woodrow Wilson Bridge west to Alexandria, Virginia. Exit 1B follows onto National Harbor Boulevard south. Photo taken 12/16/16. Interstate 295 south reaches Exit 1B to National Harbor, a mid-2000s upscale development along the east shore of the Potomac River. Signs for the mainline reflect the 1.7-mile extension east to Maryland 210. Photo taken 08/04/13. The freeway connector curves east and parallels I-95/495 north before turning south to join Maryland 210 (Indian Head Highway). Photo taken 06/01/04. Additional photos showing I-295 south at the Capital Beltway posted on the Interstate 295 South D.C. guide. Photos from 2001 and 2004 showing older configurations of I-295 south at I-95 & 495 posted at Interstate 295 D.C. – Archive. Exit 2B departs from the Local Lanes of the Woodrow Wilson Bridge east for Interstate 295 north and National Harbor Boulevard south. There is no access to I-295 from the Express Lanes. Photo taken 12/16/16. Traffic to both I-295 north into Washington, DC and south to the National Harbor development departs in unison from the east end of the Woodrow Wilson Bridge. Photo taken 08/04/13. The Local Lanes of I-95 & 495 north reach the off-ramp (Exits 2A/B) for I-295 north to I-695 west to Downtown Washington and National Harbor. Photo taken 08/04/13. Exit 2A separates from the ramp for I-295 north to both National Harbor Boulevard south and MGM National Avenue east to the December 2016 opened MGM National Harbor casino resort. Photo taken 12/16/16. All approach signs for Interstate 295 posted along the Capital Beltway east found at Interstates 95 & 495 North – Outer Loop. Exits 2A/B departed Interstates 95 & 495 north for I-295 north and the MD 210 freeway spur in this scene during the Woodrow Wilson Bridge project. The ramp to I-295 north remains the same, traveling the lowest level of the overall interchange. Photo taken by Steve Hanudel (08/12/05). The old configuration at Exit took traffic to both I-295 north and MD 210 (Indian Head Highway) south in unison from the Capital Beltway east. Exit 3 now consists of a flyover ramp for the Indian Head Highway freeway spur, while Exit 2A serves National Harbor. Photo taken by Steve Hanudel (08/12/05). I-95/495 southbound separates into a Local and Express configuration ahead of both Interstate 295 north and the Woodrow Wilson Bridge. Access to I-295 north requires motorists to take the Local Lanes to Exit 2B. Photo taken by I.C. Ligget (03/26/10). Additional coverage of the Capital Beltway south at I-295 posted at Interstate 95 & 495 South – Capital Beltway Inner Loop. 2005 photos showing Interstates 95 & 495 south at I-295 available at the Interstates 95 & 495 / Capital Beltway – Inner Loop – Archive page. MD 210 (Indian Head Highway) north approaches the ramps for the Capital Beltway. Previously signs referenced I-295 here. New signs separate traffic to the Express and Through lanes. Interests to I-295 north via the 1.7-mile spur of MD 210 should take the upcoming ramp. Photo taken by Chris Elbert (07/06). The right two lanes transition from Maryland 210 (Indian Head Highway) north to both Through lanes of I-95 & 495 and the spur to Interstate 295 north. A loop ramp ahead connects with the Local Lanes of the Capital Beltway inner loop west to Alexandria. Photo taken by Chris Elbert (07/06). Southeast Freeway (I-695) aDCRoads.net (Steve Anderson). Baltimore-Washington Parkway (MD 295). DCRoads.net (Steve Anderson).